The Rosewill R536-BK is full of features that make your new system perform with real muscle. This case comes with plenty of room for expansion, with three 5.25" external, one 3.5" external, and five 3.5" internal drive bays. A 120mm fan delivers outstanding ventilation and exceptional system cooling, along with a mesh front bezel for better internal airflow. A 500W power supply is also included to provide stable and strong power for your components. Constructed of Hot Dipped Galvanized steel, the Rosewill R536-BK is charming, as well as sturdy. 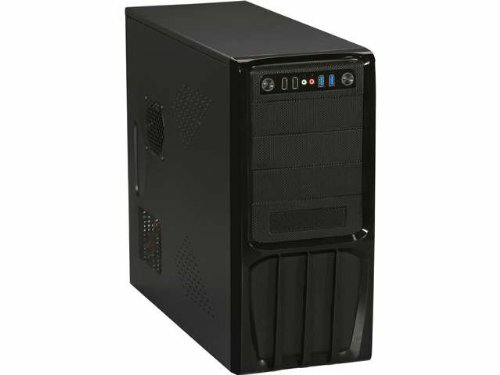 PC Case + Power Supply: Excellent mid tower computer case with 500W power supply (psu) delivers the best solution for your computer system. Easy Access I/O Port: This is an office computer case with 2 x USB 3.0, 2 x USB 2.0, Audio In/Out Front Ports to offer the easy access to this computer case at the front. Excellent Airflow: With 1 x 120mm rear computer case fan, ROSEWILL R536-BK offers the optimized ventilation to our users for long time operation. Stylish Design and Look: This ATX computer case / desktop case has a stylish look front panel. With solid and cool front panel, R536-BK gives you a better option of your office desktop. Sturdy Construction: To level up the experience for users, R536-BK is a solid body with vented PCI-E slots and perfectly ideal for intel and AMD systems.